Wondering where to go on vacation? How about discovering Southeast Asia. Thailand, Laos, Cambodia, and Vietnam have so many options for a traveler. You can get a beautiful tan on a postcard beach or wander through palaces as you have never seen anywhere else. Did I mention the food? There are so many delicious dishes and treats to try in each country, you will have to go back many times to enjoy it all. Here is a look at some of the well-loved places to visit and relax in Southeast Asia. Thailand is located on the western side of Southeast Asia but takes up a good part of the centre of the land mass. Top things to do in Thailand, besides taste the delicious food, are plenty. You can go to any one of the fabulous beaches and snorkel and get a tan. Really, you can just marvel at the beauty of nature Thailand has to offer. 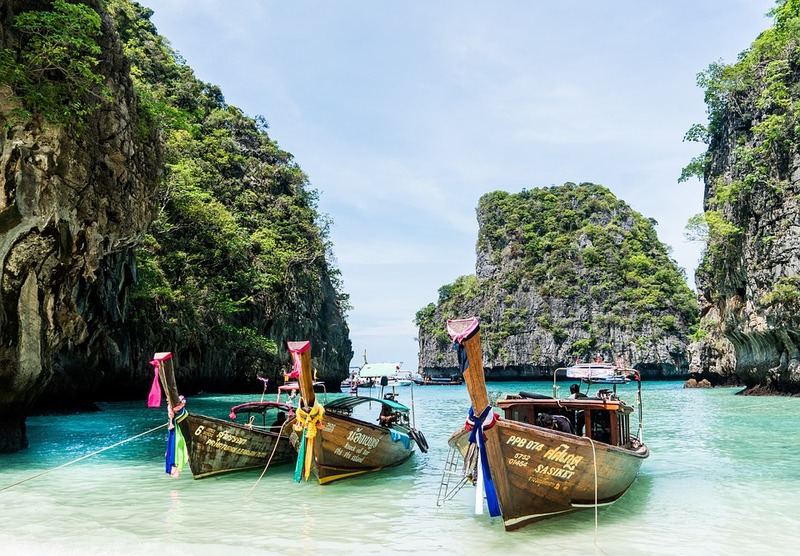 Phi Phi Island is a major destination with it’s towering rocks and crystal waters. Taking a train over the Bridge on the River Kwai and sea cave kayaking is very popular in Thailand. Floating markets and Bankok’s Grand Palace are tourists favourites. The choice is yours, pick your favourites. You can take Thai cooking classes while in Thailand and bring a part of your travels home with you. There are also plenty of large elephants to see in wildlife parks across the country. Vietnam is nothing like it was during the war. Vietnam is a beautiful country with lots to see. The Vietnamese welcome tourists with open arms and offer delicious food. Vietnam is in the southern part of Southeast Asia. You will, of course, use Vietnamese Currency, which is the Vietnamese Dong, when you are there. While in Vietnam you can visit Halong Bay and Hoi An, which is an ancient town. You can see the Cu Chi Tunnels and swim around Hon Mun Island. There are plenty of comfortable hotels to spend the night. Cambodia is north of Vietnam and covers part of the west side of Southeast Asia. You can hike Udong Mountain and see waterfalls in Phnom Kulen National Park in Cambodia. Cambodia also has excellent food to choose from. You can also go to the Bayon temple and Ta Prohm ruins. There also lovely beaches to visit in Cambodia. Coconut milk, eggs, lemongrass, fish, chicken are just some of the foods you will eat while in Cambodia. The cooks and chefs combine the flavours and treat you to a culinary culture you won’t find anywhere else. Laos starts in the north of Southeast Asia and reaches down to both Cambodia and Vietnam. Although there are no beaches in Laos, there is plenty of natural beauty to enjoy. Backpackers love to go to Vang Vieng to see the lovely mountains, rice fields, towns, and limestone cliffs. Bolaven Plateau and Tad Fane Waterfall in the southern part of Laos is absolutely stunning with the waterfall and all the greenery. There are many monuments and temples with many different sizes of Buddhas to be near to feel peace and tranquility. Shrimp, tuna, vegetables, fish sauce are just some of the delicious food you will get to taste while visiting Laos. Laos, Thailand, Cambodia, and Vietnam each offer their own taste of Southeast Asia. The people from each country are hospitable and will do everything to make your stay an enjoyable one. You will find that not everyone speaks English in Southeast Asia, but this is not a concern. Most people can figure out what you want if you try to communicate. A smile always goes a long way. You could go back to each country several times and still not see all the beauty and wonder there is to find in this amazing part of the world. Southeast Asia is very different from the United States which is exactly why you should go and experience something totally different than what you know. You will take wonderful memories back home from traveling in this part of the world.